Enterprise architecture and the goal of aligning business goals with standardized IT best practices took a major step forward with the announcement this week that the Association of Open Group Enterprise Architects (AOGEA) will merge with the Global Enterprise Architects Organization (GEAO). The goal of the merger is to offer the 9,000 combined members opportunities for certification and to establish standards for excellence. The Open Group currently offers its IT Architect Certification (ITAC), as well as ongoing advocacy and education services, as well as peer networking opportunities. I've long been a believer that architecture is destiny, and that aligning business goals with IT initiatives is made more critical by the current economic situation. Adherence to good architectural principles pays the greatest dividends when IT organizations need to support the business through turbulent times. The ability to react swiftly, securely and to use IT as a business differentiator can mean the difference between make or break for many companies. According to The Open Group, the combined organization will deliver expanded value to current AOGEA and GEAO members by providing them with access to an increased range of programs and services. For example, AOGEA members will benefit from the GEAO’s programs and content focused on business skills, whereas GEAO members will benefit from the AOGEA’s distinct focus on professional standards and technical excellence. 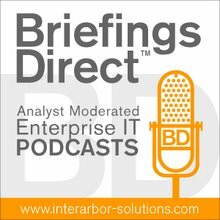 I recently had a series of wide-ranging interviews with officials and members of The Open Group at their 21st Enterprise Architecture Practitioners Conference in San Diego, in which we discussed cloud computing, security, and the effects of the economic decline on the need for proper enterprise architecture.